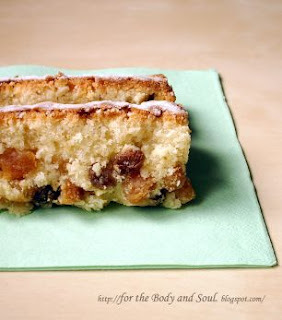 This is a fabulously easy and quick cake to make; you just put all the ingredients to a bowl, mix them with an electric mixer, stir in the apricots and raisins, and the batter is ready to go to the oven. It all takes only about five minutes. The cake is long to bake, but this is actually a very pleasurable experience as, while in the oven, the cake perfumes the entire house with a wonderful coconut scent. It comes out from the oven extrememly moist, tender and very fragrant. The use of coconut milk adds a depth of coconut flavor which, I suspect, couldn’t be achieved by desiccated coconut alone. 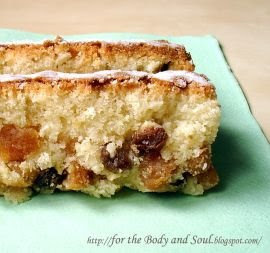 The recipe for this delicious cake comes from a Polish food blog (some posts also in English) White Plate written by Liska. The original recipe in Polish can be found on her blog here. Enjoy!!! Grease 20 cm springform pan. Using an electric mixer, mix all the ingredients, except raisins and apricots until smooth. Stir in dried apricots and raisins. Pour into the pan. Bake for 1 ½ hour.